In the Southern Carpathians, harsh weather frequently pushes wild animals to lower altitudes, thereby bringing them closer to villages. 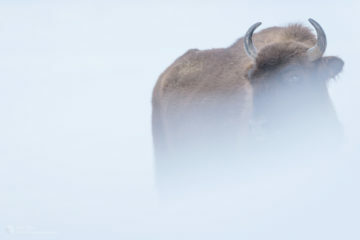 Close encounters with bison can be prevented by keeping a safe distance. In winter, and especially in times of heavy snow, bison do not have access to their main food – grass. While fully wild bison are accustomed to foraging in harsh conditions, those born and raised in captivity, and then newly introduced to the wild, are less capable. Until they adapt to their surroundings, they are sometimes attracted to more accessible food sources, such as haystacks. As part of the Southern Carpathians rewilding team, bison rangers (locals from Armenis and Poieni rewilding areas), together with members of the WWF Romania team, work in the field to monitor the movement and health of reintroduced bison. If necessary, they intervene to keep the animals a safe distance from villages. Interaction between bison and villagers in the Southern Carpathians rewilding area has happened in the past. A record is kept of these interactions and is used to improve future decision making regarding human-wildlife management. Bison rangers in the Southern Carpathians mount camera traps as part of the local wildlife monitoring programme. 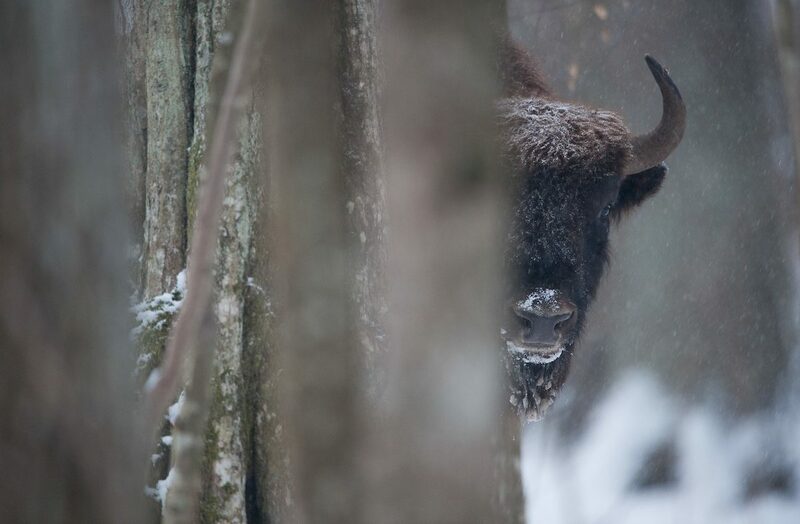 In the winter of 2017, a female bison reintroduced into the Țarcu Mountains became separated from the large herd in the Bison Hillock area and came down into the village of Feneş. Having been transported from a zoo in 2015, she was very accustomed to the presence of humans and initially found it difficult to adapt to the wild and harsh winter conditions. All reintroduced bison undergo a period of acclimatisation to local natural and climatic conditions before they are fully released and become free roaming. However, some animals regain their survival instincts more slowly, depending on the frequency of their interactions with humans, and the feeding habits acquired at their former zoos and reserves. “In extreme weather conditions, such as those we have seen this winter, rangers will distribute hay, concentrate and mineralised salts in areas usually frequented by the bison,” explains Stefanut. “This means they are less likely to wander into villages. Electric fences have also been installed, but only in very high-risk localities. Bison do not pose an immediate danger, but it must be remembered that they are still wild animals. In terms of interacting with people, bison do not pose an immediate danger, but it must be remembered that they are still wild animals. Attracting them with food or engaging them directly is ill-advised, to avoid familiarity with humans and prevent damage to goods. Bison can weigh up to 1000 kilogrammes and can run at up toto 55 kph. Stay at least 100 metres away from any bison! Bison may appear docile, but can be defensive if they feel threatened. Do not approach bison to take pictures, or for any other reason. Your bison selfie isn’t worth your own life! If a dangerous bison encounter does take place, inform bison rangers, the local authorities or police. 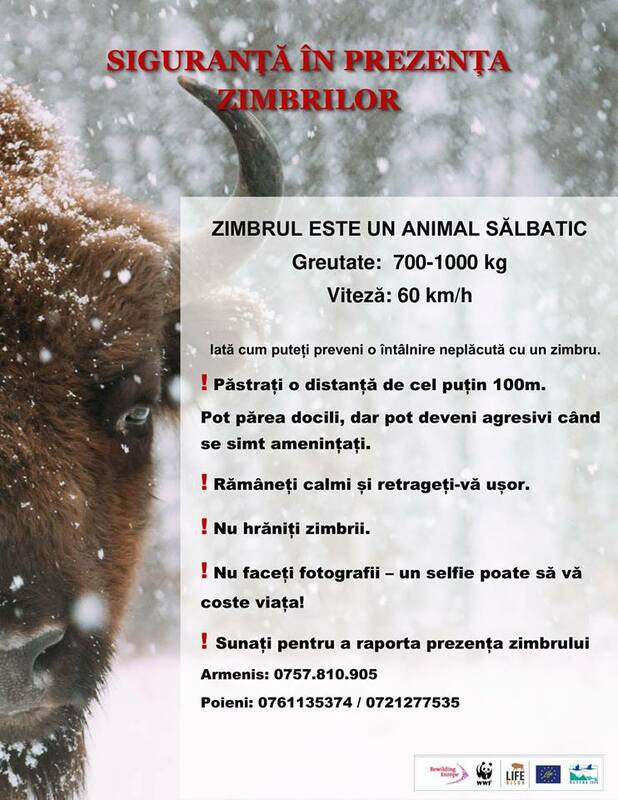 The Southern Carpathians rewilding teams recently distributed a brochure and poster in both rewilding areas, informing local people about the monitoring process and providing conflict prevention tips. Follow the action that takes place in the field on the Rewilding Southern Carpathians Facebook and Twitter pages.